See the highlights of Perth on a Segway tour along the city’s booming and beautiful riverfront. With a knowledgeable guide, cruise along the Swan River, and check out attractions like Kings Park, Claisebrook Cove or the river foreshore, depending on the option selected when booking. By allowing you to cover more ground than a walking tour but still be outside in the fresh air, a Segway is the ideal way to explore a sunny, outdoorsy city like Perth. 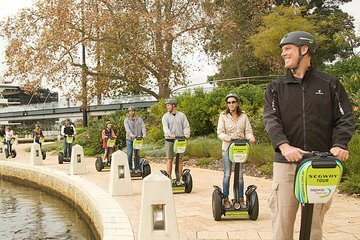 Your Perth Segway tour starts at the Barrack Street Jetty, where you’ll meet your guide and listen to an orientation about your Segway. Spend a little time practicing how to operate your personal electric transporter, and then set off beside Perth’s Swan River. When booking, you have three tour options to choose from: the West Foreshore, East Foreshore or Riverside. No matter which adventure you select, you’ll learn about Perth’s history and modern-day culture while you glide down riverfront paths and admire attractions like Kings Park, the University of Western Australia, wetlands or the Elizabeth Quay development. See the Itinerary section for more tour details. On the 1.5-hour West Foreshore Tour, your guide takes you around the perimeter of Kings Park, one of Perth’s jewels. See picnic areas, walking trails, and an impressive botanic garden that holds more than 3,000 species of indigenous plants. Next pass the defunct Swan Brewery, which recently closed after 150 years of business. Finish by riding along the University of Western Australia campus, located on the river. The 1.5-hour East Foreshore tour takes you through riverside wetlands, where you soak up the sight of boats and open green space along the mighty Swan River. Look for birdlife and admire the botanic garden. After, glide past the West Australian Cricket Association en route to Claisebrook Cove, a prosperous district full of cafes, public sculpture and grand houses. With departures in the morning and afternoon, this 1-hour tour takes you through the lake areas next to the Swan River Foreshore. Your guide shares facts about the animal life in this urban paradise that attracts migratory birds from as far away as Asia, Mongolia and Siberia to spend part of the year here. Cruise around the new Elizabeth Quay development, where city planners aim to create a bustling district on the riverfront. First time using a Segway, they are very easy for anyone to use. The instructor was nice and helps to enjoy your experience. The tour leader Justine was lovely, friendly and helpful. Had great fun on this tour and definitely can recommend. The Segway is easy to use, and the staff give you excellent training before venturing out on the tour. Learned some interesting facts and had fun two thumbs up. This is certainly a lovely way to see areas around the Swan Lake. It was fun and educational. Our guide, Andy, was patient, professional and friendly. He makes it a point to remember the names of his tour group members and calls us by our names, making us feel at ease throughout the tour. A fabulous tour - so much fun with very patient and informative instructors. Fantastic experiences here sightseeing around the river, nice and friendly staff. If i come again i will make another one.